Johnston brings his exquisite, idiosyncratic—and by turns seductive and strange—visual sensibility into this suite of love poems, which are literally pulled forth from the video image by user interaction. Sooth, like slippingglimpse elsewhere in this collection, is one of a growing number of works that seek to integrate algorithmically animated, interactive text with rich video imagery. Despite the title of Johnston's work, however, these images and soundscapes can stray far from the type of imagery associated with "love poems," leading the viewer/user into a compelling meditation on the body, the soul, the subconscious and the desires and fears that plague it. On a national level, Sooth, which slips between French and English based on user interaction, enigmatically addresses the subterranean linkages of the "two solitudes" that is present-day Canada. 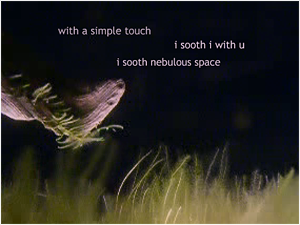 Author description: Sooth is a set of love poems interactively triggered phrase-by-phrase to fly in flocks over original video. Sounds associated with each phrase are mapped to audio which pans and volume shifts in space as the phrase flies. Easing equations are randomly shuffled to create a sense of behavior to each phrase. Text-code-video-audio all original and released under a Creative Commons 2.5 License. It was created while I was artist-in-residence at La Chambre Blanche web-lab in Quebec city. Bilingual: French-English in same interface.